I have seen a few sewing room posts lately and really like seeing where you guys sew. I thought I might get in on that action with my sewing room. This is what I see when I walk in...bwahaahahahahaha, not really. I usually see piles of stuff everywhere, but it is somewhat tamed today. Let's walk around the room. I think I am so clever for this, but I ha an old DVD rack that I carried all the way out to the curb when it occurred to me that DVDs and patterns are about the same size. I marched this rack upstairs and sure enough all my patterns fit! They are even organized. Dresses on top, pants and tops on the next row down divided by some doo dad that came made onto the shelf and so on. It may be a bit of an eye sore, but when I want to go buy a new pattern I have a visual reminder that I am a hoarder and must be stopped. That little thread holder there was given to me by my friend Jenny. It used to be brown, but I am spray paint happy. I get some mad morning sun in this room as you can see. Here is my cute new sewing desk, this one I bought used from Jenny. Isn't it pretty? It came that color and inspired much spray painting. That ironing board is new too. My old one was destroyed in the move, so I upgraded to a bigger one. I love it. 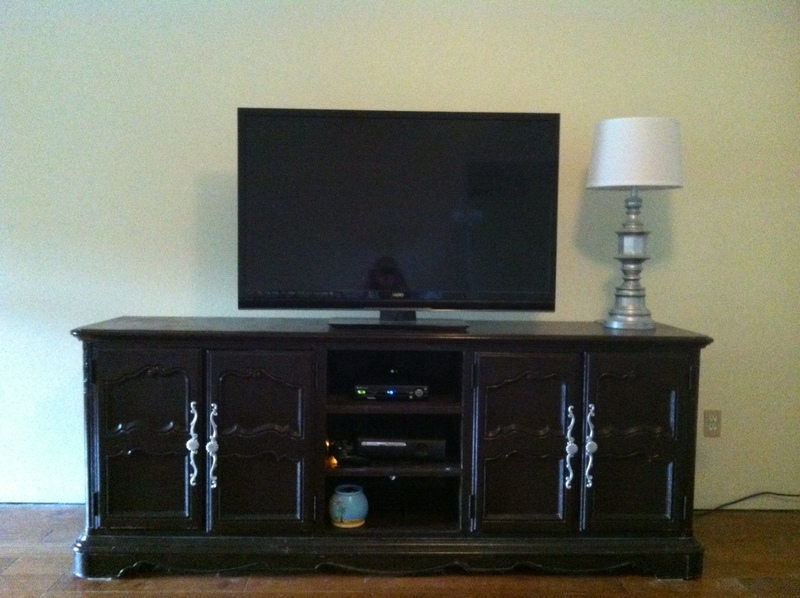 This is my media center and a few sewing related decorations. Most of the visible decorations were also fro Jenny. That black thing there was a Monet poster that I turned into a chalkboard and sprayed hot pink. Here is the awesome part, it opens up to reveal a peg board. I am still deciding what is going in there, but I have always wanted a peg board. This used to be my sewing table, and before that some one's dining room table from Craigslist. It makes a great cutting station. 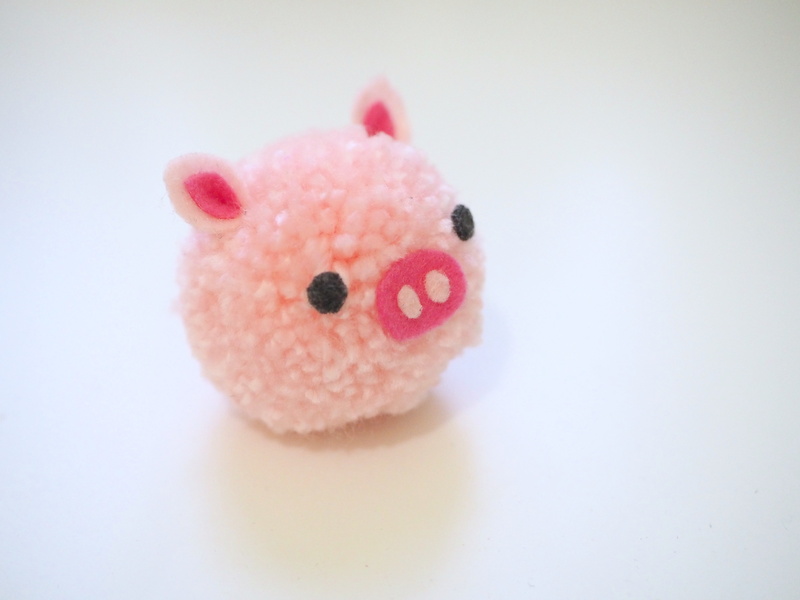 There is a little preview of something I am considering. By the way, go team Sebrewing! Our team won the Hummingbird contest! I am such a fan of Cake patterns now. This a bolt holder, also from Jenny which I believe came from Sew Crafty, the place I learned to sew before it shut down. It holds all my books and bolt type fabrics perfectly. 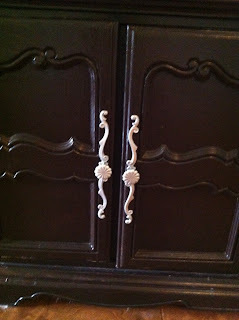 The old owner of the house we bought left this little dresser in my new sewing room, dibs! My friend Holly is an organizing genius and helped me get my supplies organized inside. Remember all those estate sales I scored at? It was ugly! Up top I have buttons, elastics, feet and random knick knacks. Next drawer contains my packaged notions and elastics. The bottom holds obscene amounts of lace, the down side of estate sale bundles, specialty threads and my embroidery machine materials. And I have a closet! My stash is hanging out, with knits on the shelf with my embroidery machine. I also have interfacing, batting and current projects on the other side. Now I am headed out of town for the weekend to spend a fantastic weekend on a road trip to the Big Easy. I can't tell you how much I love New Orleans. Do you see that dresser there to the right? 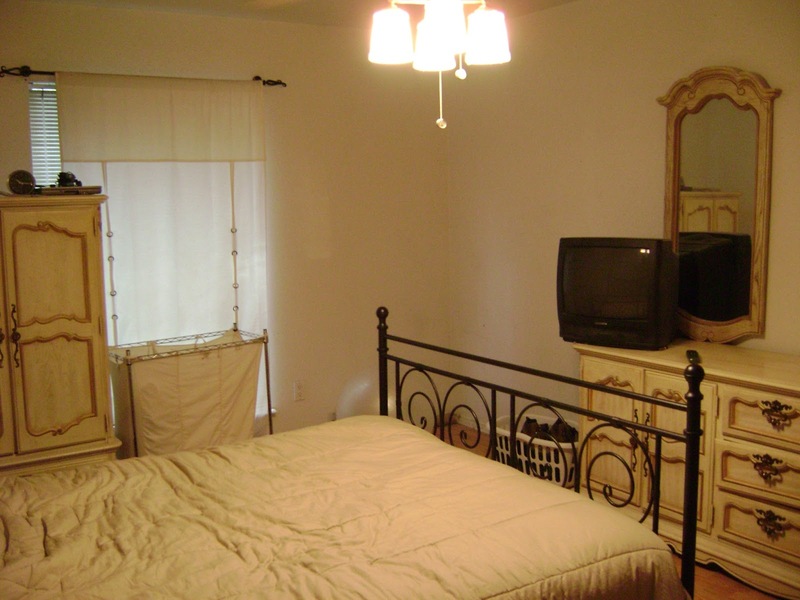 I found it on Craig's List years ago along with that armoire on the left when my old dresser basically fell apart. This picture is at least two years old, so it has been awhile. I loved how sturdy it is, but hated the look of it. Fast forward to our move in April, and Mr. Thinks He Can and his helper could not get that eye beast up the stairs (it weighs roughly a thousand million pounds). I was not going to let it live in the master bedroom anymore, so it stayed in the living room. 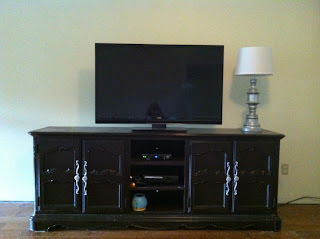 We needed a new entertainment center, and since the hideous dresser was already there, I tried to figure out what to do. Ta-da!!!! I painted it dark brown, with an oil based paint. By the way, no one tells you this until you are no longer capable of Googling, but oil based paint does not come off your skin. When I finally got my finger clean enough to Google how to remove the paint I found out I needed to scrub it with oil. A bit of vegetable oil and a shower later it was off, and my skin was beading up like I'd been treated with Rain-X! Don't say no one warned you. I enclosed the areas the three drawers were in the middle and drilled a hole in the back of each one for cords to fit through. That bottom one is where my laptop usually sits and charges. 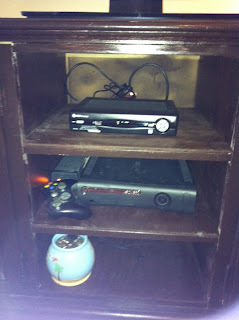 By the way, I have a dollar for anyone that can find the box with my camera in it! 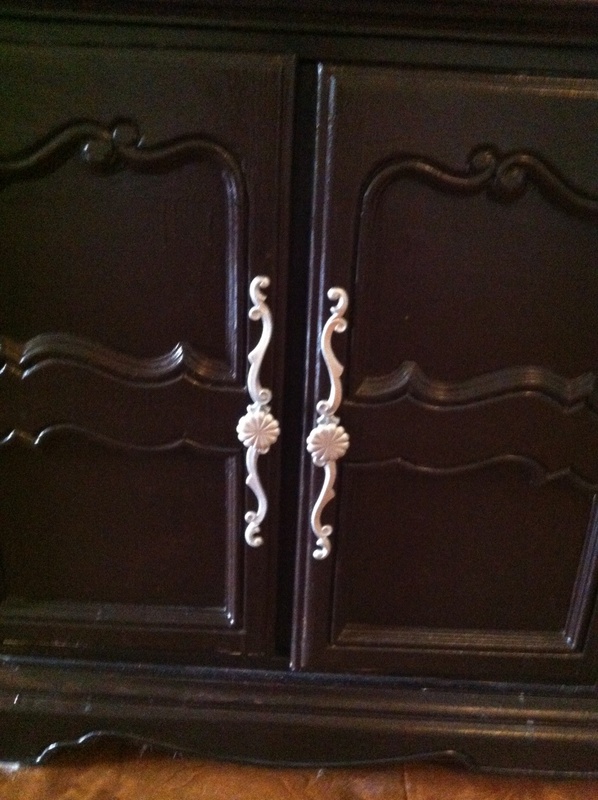 The hardware was a strange size, so I decided just to spray paint it brushed nickel. It is a bit sparkly up close, but it mostly looks normal where it sits. 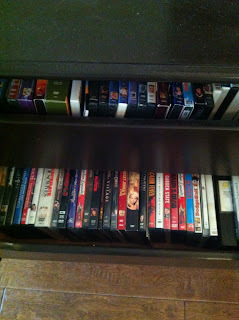 Check out how nicely the drawers behind the doors fit my DVDs! Disclaimer: I used to work in marketing for movie companies, so most of these were free. Not Buffy though, I had to buy that and it was totally worth it! Here is the before of the lamp. I got it for $3 at the thrift shop down the road. I really liked all the detail of the shape of it. 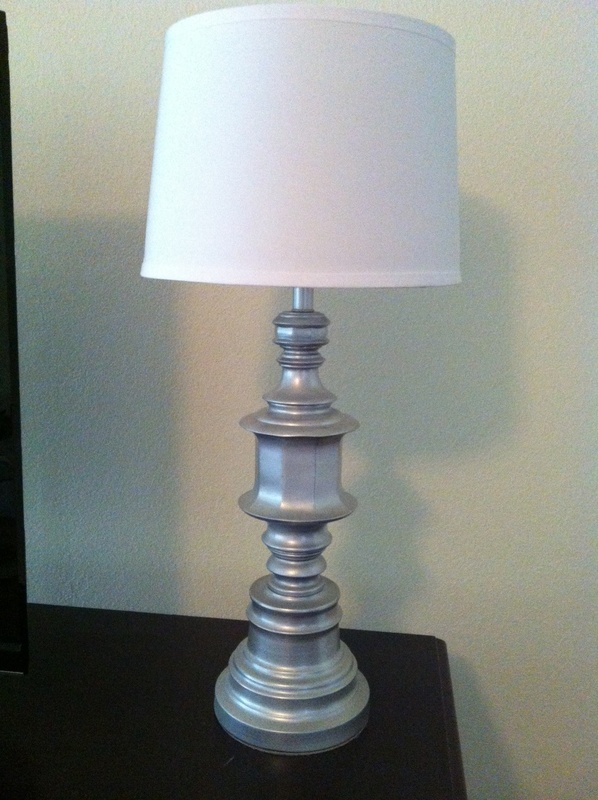 Here it is again given a coat of primer and that same brushed nickel spray paint as well as an updated lamp shade. Not bad, right? Back to sewing soon! The armoire is still in it's hideous state in the garage. I'm thinking on it if anyone has any ideas... The mirrors off the top of the dresser may be painted and hung. I did it! This bag took me nearly a year to complete, but I am very happy with it. 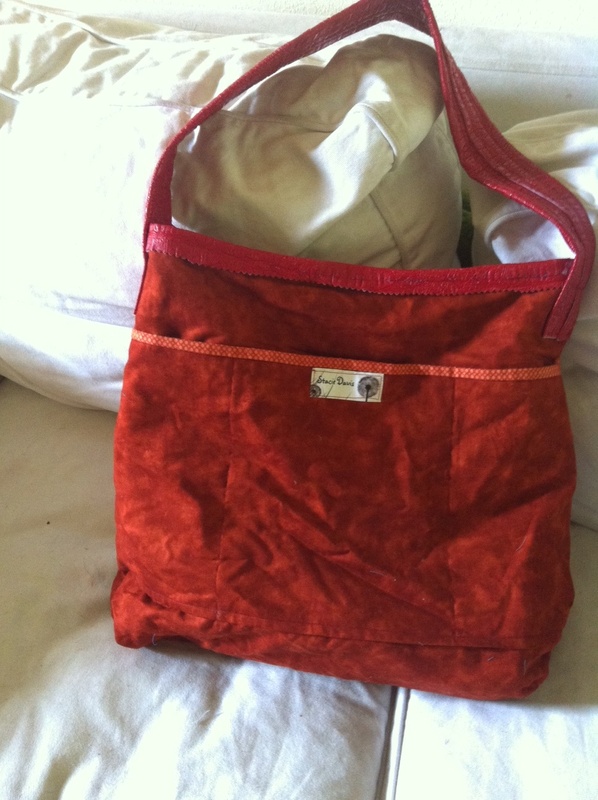 This is the Urbanista Hobo Bag by Paradiso Designs. I don't know that anyone remembers when I got this. I met Cheryl, the talent behind Paradiso at the quilt show in November. She even donated that awesome red pleather you see around the top, bottom and on the straps. I have to say working with pleather is really not that bad, and Cheryl offers a lot of advice on how to do it. This pattern kept getting pushed aside between moves and procrastination, nearly finished, for months. My old tote is shot and I knew it was time to make a new one. 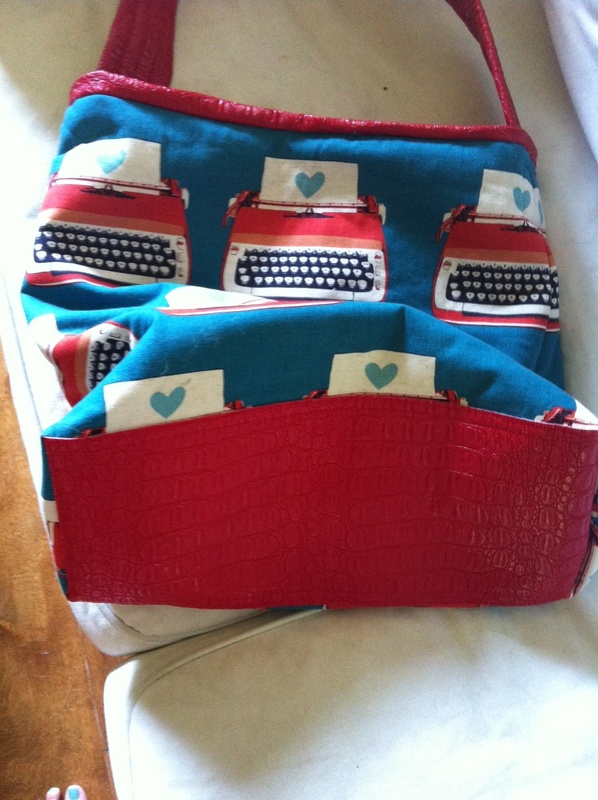 How cute is that red pleather alligator bottom? I love how funky the whole bag is between the red alligator and Echino typewriters. I did change the straps up some. The pattern has you do an awesome through the side and buttoned technique, but I wanted my strap to be a little longer, but at the time I got a bit overwhelmed with the directions. I would not suggest this as a first bag project for people. I would try my hand at the strap as directed though, it is very cute. 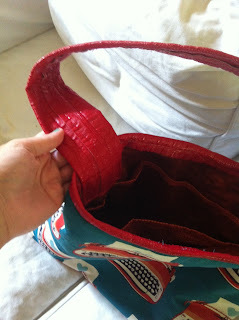 The inside is filled with pockets, which is perfect for me. 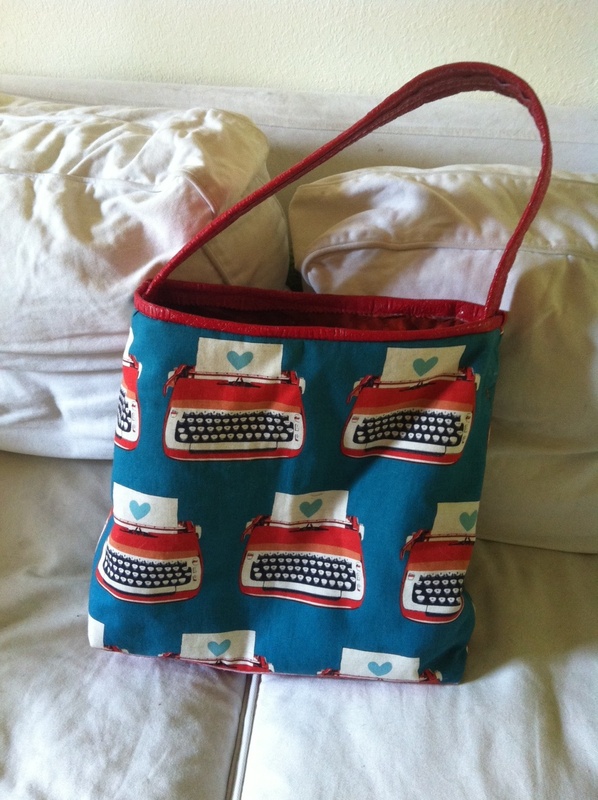 I love my new tote.